Hello everyone. This is the Production part (Upper Cutting & Prefabrication) of this SOP . If you don't read yet the first 6 parts you can read them from the following links. In this part we are talking about Procurement department. Making Shoe is a Step-By-Step Process. 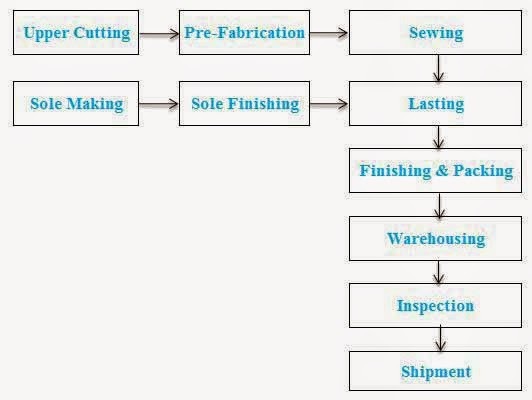 Bellow chart is a shoe making process chart. First step in making shoe is to cut the upper material into shoe components as per the required style. There the cutter places the material on the clicking machine and cut it with the help of cutting die /knife to achieve the following objectives. To cut the material into component as per plan, style and size assortment within the stipulated time. To ensure the best utilization of the material. To ensure the right quality of the component in the most efficient manner. To make an analysis of the file, production plan received from planning and the approved sample. In case of any deviation to be communicated to the person concern and get those corrected. To place a material requirement (leather, synthetic and fabric etc) called SR as per style, type of material and prescribed quantity to the raw material store for the following day. To receive material as per the approved swatch & quantity and to keep them in the mini store in the section. After receiving, the cutting knives are checked with the pattern, a pair of component is cut, pasted in a board after all the prefabrication job called dummy test and get it approved by the sample dept. To issue cutters ticket as per the cutting plan, style and cutters capacity. To check material with the sample/swatch board supplied by PD dept. To issue material as per cutters ticket and also the cutting knife. After the components are cut, the pieces are checked & counted first by the helper and then by the quality checker and put into poly bag pair by pair. In case of nonconformity of the components, the bad components are dropped in a bag attached in the cutting table and make the necessary replacement. The bad components are used for cutting smaller components whichever possible avoiding defects. The supervisor collects the good components every hour and sends for pre-fabrication. The cutter has to complete the stipulated number of pairs within the prescribed quantity of material. In case of surplus, he /she has to returned the material. In case of any shortage he/she needs to give explanation justifying the need and get it approved by the planning dept. Surplus material to return to the store after shipment of that particular style. Cutting leather: The method of cutting “uppers” from a leather is a great importance, and is necessary for cutter to know the structure of the skin. The cutter must know which parts of the skin have better physical properties, the direction of the stretch and the nature and origin of the various defects. A good cutter will always be cost minded and get maximum utilization from a skin. A good cutter must know how to use to the maximum the various parts of the leather. Cutting synthetic and fabric: Synthetic material & fabrics are cut in layer. Depending on the thickness and hardness of the material the number of layers is determined. Some times to maintain the design, particular direction need to be maintained. Knives: The knives are manufactured from steel. Double edge cutting knives are in use wherever possible; this minimizes the number of knives required, so reducing cost. 32 mm. for textiles and other multi layer cutting. Cutting Block : The blocks on which leathers cut are made of poly propylene or phenolic resin block, the cutter should always use the entire surface area of the block to wear it uniformly, this saves knives and improves cutting quality. Normally the swinging head cutting machines are used for cutting leather and Beam head cutting machines are used for cutting synthetics & Fabric. Safety on Machines: The double control system on cutting machines requires both the hands of the cutter to be on top of the machine, so ensuring that he cannot get his hands caught between the cutting head and the knife. Splitting to bring components to desired even thickness as per the requirement of style. Lamination for reinforcing certain parts of the upper to give strength and comfort. Embossing any decorative design, punching etc. Because of the number of processes involved in prefabrication it is important that there is as little handling between feeding and collecting the shoe components as possible. The quality of the prefabrication process can impact the quality of later processes. Quality Inspection: After completion of all the operations in the cutting & prefabrication, each and every component are checked pair by pair, put in poly bag and store in the cutting dept. for delivery. In case of non conformity, respective components are replaced. Pls help to advise what are the test requirements for shoe? Depends on the buyer. What they want to test. Nice post, containing good information. Thanks for sharing this post. Very good information covering all relevant areas.It would have better if in process quality control incorporated in the process.